Maria wants Shane to know the truth. Mrs Forbes wants the manure pit dug by Saturday. Danny and Scott finish the pit, but Mrs Forbes insists it isn't finished. 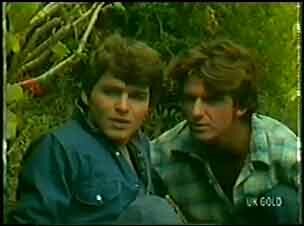 Max tells Shane that he and Maria have decided to separate. Shane is stunned. Max says that he and Maria have grown apart. Shane demands to know if Max has met someone else, but Max says he hasn't. Max tells Shane that it's not sudden - they've been thinking about it for a long time. Shane is very upset and tells Max he's throwing away 21 years of marriage. He storms of to the pub. Max tells Maria that now Shane knows, he'd find it easier if they didn't sleep in the same room. Shane is on the verge of tears as he tells Daphne about the marriage break-up. He doesn't think Max and Maria are making any effort. Daphne tries to calm him down, telling Shane that Max and Maria aren't trying to hurt him on purpose. Now Shane has to accept their decision. Shane can see Daphne's point of view, but still thinks the decision is wrong. SHANE: God knows what it's going to do to Danny. Danny doesn't think Mrs Forbes will ever pay them. He says he's got an idea - they could take the money out of her purse. Scott says it's stealing, even if she does owe them money. Danny reckons Mrs Forbes is the type to hide money under her mattress. He calls Scott a wimp and says he's going to do it. Danny goes towards the house with Scott trying to stop him. He makes Danny see reason - anyway, the house is all locked up. Just then, Mrs Forbes drives up so they start heaving sacks again. Julie is cleaning up and offers Jim a coffee. Max comes round to do some plumbing. Jim tries to get rid of Julie. JULIE: Are you trying to get rid of me? Max tells Jim that telling Shane went worse than he thought - but at least they're not pretending any more. Jim asks Max if he's rushing into things - maybe with a couple of weeks break he might change his mind. But Max thinks a clean break is best. Shane is sitting on Danny's bed. He tells Maria he doesn't know how Danny will take the news of the split. He asks Maria if she still loves Max. She says in a lot of ways it does, but it's not good enough anymore. Shane doesn't understand, but Maria says the split will be better for everyone in the long run. 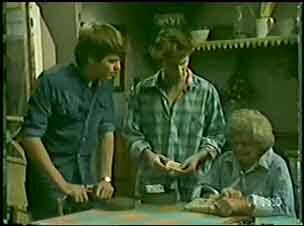 Mrs Forbes gives Scott and Danny a drink of lemonade. Apparently the manure is so that she can grow strwaberries next year. Julie is insulted at being sent out of the room while Jim talked Max. She tells Jim that she knows something is going on and wants to know. Jim tells her she is not to gossip, then tells her that Maria and Max are splitting up. Julie wants to know why and starts asking lots of questions. Jim tells her sternly to mind her own business. JULIE: What if she wants someone to talk to? JIM: Well, if she does, it won't be you! Max says that money will be a bit tight for a while with him taking on a flat. Maria offers to get a job, but Max says that it's his decision to leave, so Maria shouldn't have to change her life too much. Max says he's going to look for somewhere fairly close. MAX: Well. I suppose that's it. Maria says she needs to prepare herself for what they'll tell Danny. Max says there's no point telling him anything different from what they told Shane. MARIA: Thank you for that. I really appreciate it. Julie and Lucy are making a collage of the map of Australia. Daphne comes round looking for Helen with a recipe, but she isn't in. Daphne says she'll come back another time. Daphne looks at Lucy's map and Lucy offers Daphne to help. 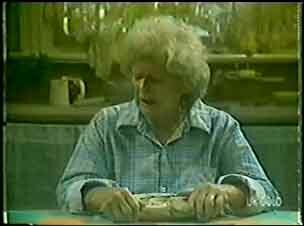 Julie tries to send Daphne away, but Daphne sits down and starts telling Lucy all about the Northern Territory. Julie gets mad and starts shouting at Daphne that she's taking over. Jim comes in through the back door and Julie moans that she's always told off for interfering, but whenever other people do it it's "helping". Jim tells Lucy that Julie is just going through a difficult time at the moment - Lucy didn't do anything wrong. LUCY: Paul's right. She's emotionally immature. Maria is trying to make a cake, but is getting shell in the mixture with the eggs. She starts to cry. Just then, Shane comes in and sees her crying. He gives her a hug. He wants to know if there's anything Maria can do to stop Max from going. Maria says there isn't. Scott and Danny have finished their work, but as they are washing themselves off the police arrive. Danny wants to leg it, but Scott won't go until he's been paid! The Constable tells Mrs Forbes that "he's dead". Mrs Forbes says she's been expecting it. 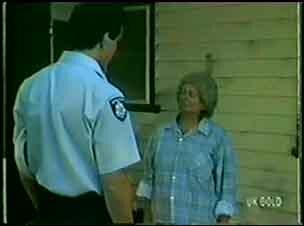 The policeman gives her her husband's belongings. She starts to cry a bit and goes into the house. The policeman drives off, much to Scott and Danny's puzzlement as they haven't overheard the conversation. Mrs Forbes is sitting at the kitchen table, crying. She tells Danny and Scott to go away. They come in and tell her they've finished the work. They realise she is upset and ask if she's OK. Mrs Forbes gives them the money they're owed. Then she shouts at them to get out.